Auflage/Format: 05.2013. 4. Auflage von '13. 1368 Seiten. 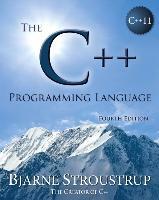 The definitive book on C++ by the creator of C++, The C++ Programming Language teaches one of the most widely-used, general-purpose programming languages. At an advanced pace this book teaches how to work with compilers updated for the new standard. Students heading toward domains where mid-size to large applications are being developed - networking, finance, graphics, and games - will find this book an excellent learning tool. Bjarne Stroustrup (www.stroustrup.com) is the designer and original implementer of C++, as well as the author of Programming: Principles and Practice Using C++ (Addison-Wesley, 2009), The C++ Programming Language (Addison-Wesley, 1985, 1991, 1997, 2000), and many popular and academic publications. Dr. Stroustrup is a University Distinguished Professor at Texas A&M University and the holder of the College of Engineering Chair in Computer Science. He is a member of the U.S. National Academy of Engineering, an IEEE Fellow, and an ACM fellow. His research interests include distributed systems, design, programming techniques, software development tools, and programming languages. He is actively involved in the ISO standardization of C++.